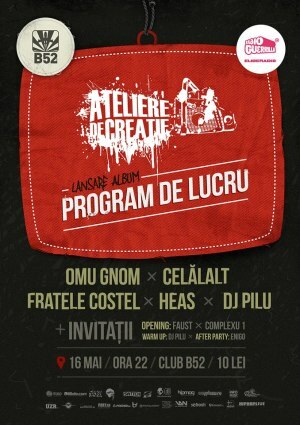 Ateliere de creatie (a music collective made of Omu Gnom, Celalalt, Fratele Costel, Heas and Dj Pilu) launches the album "Program de lucru" (Working Schedule). "Ateliere de creatie - album launch" Concert in Bucharest. You can get here description, reviews, address, time and details of "Ateliere de creatie - album launch" Concert in Bucharest. Visit Bucharest Tips for more Concert events in Bucharest!